You are here: Home » Blog » TWO RBA Viking Cheer Squads win National Championships, bring home SIXTH National Title! Leland- This weekend, two Roger Bacon Academy (RBA) cheer squads competing in different divisions each won the top prize at Pop Warner’s National Cheer and Dance Championships in Orlando, Florida. These two wins bring the number of RBA Viking National Champion squads to six since their first win in 2011. Broadcast on ESPN, the week-long competition saw more than 400 teams from across the nation compete in their respective divisions. RBA had all four of its teams qualify for nationals, with each team securing an award in its division. 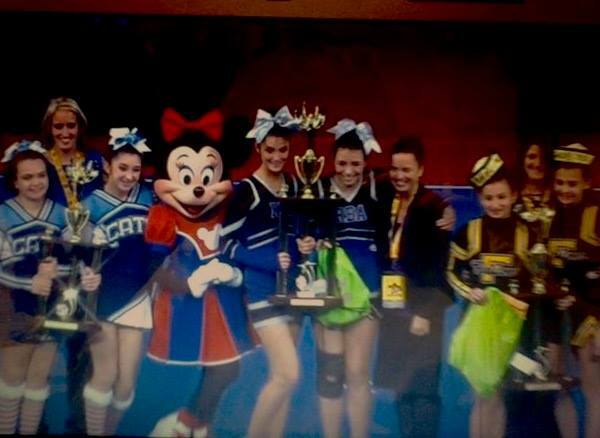 Two teams, the Midget and PeeWee, won first place National Champion titles in the highest difficulty Level 4 division. The Junior PeeWee squad won the “Spirit of Sport” Award, and the Junior Midget team placed fifth in the Nation, having only been established four months ago in August. Jean Lafave coaches each RBA squad and has built an impressive career of grooming six National Champion squads in four consecutive years—a record that would likely make a high school football coach a local legend. A volunteer, Lafave credits her successes to the hard work of her cheerleaders and the dedication of their parents, many of whom volunteer as assistant coaches. The squads are composed of 100 e lementary and middle school students from Charter Day School in Leland and Columbus Charter School in Whiteville. The public charter schools are also the highest scoring in their respective counties on End of Grade tests. The schools also offer a Pop Warner football program and have a current, 5-time State Champion Archery program. “More than national titles, these wins are a deeply-felt example of hard work translating into success for pre-teen and teenage girls. I like to think that the ESPN broadcast and trophies help to ensure that the lesson is remembered for life,” Lafave adds. For more information on RBA’s cheerleading program or its four affiliate public charter schools, visit www.rogerbacon.net.